Lay of plate of endive Gorgonzola appetizers on the table and I guarantee you they will be gone in minutes. And I don’t mean the dog will eat them. My guests devoured them and I was only sorry I hadn’t made more. And they’re low-carb, to boot! Except for the honey but there’s just a drizzle of honey. Look at the beautiful blue veins in this hunk of Gorgonzola, Italy’s most famous blue cheese. 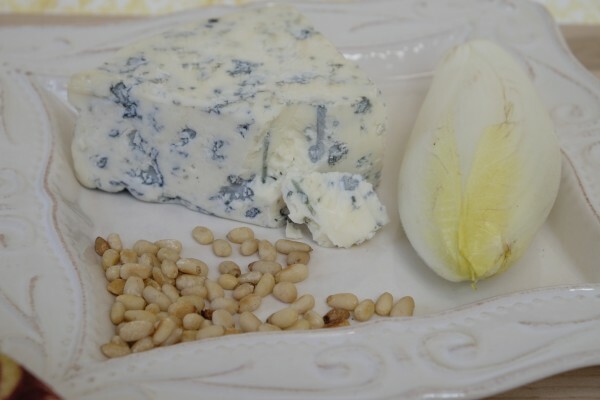 Gorgonzola originated in Lombardy and is made from unskimmed cow’s milk. This cheese is creamy yet crumbly and melts easily so it’s great in recipes but, to me, it’s most delicious just plain flaked and paired…as it is here with endive. Choose the sweeter Gorgonzola Dolce over the Gorgonzola Piccante and crumble off about 2/3 of a cup. Slice the bottom off a head of endive and separate the boat-like leaves. Choose about 12-14 nicely-shaped leaves then carefully clean and dry them. Toast the 1/2 cup of pine nuts by tossing them in a dry skillet over medium-low heat for no more than a minute. Mine toasted in a little over 30-seconds. Some stores such as Trader Joe’s sell already-toasted pine nuts. Be mindful that quantities will vary depending on how many of the endive boats you choose to make. As for the honey, first a detour. 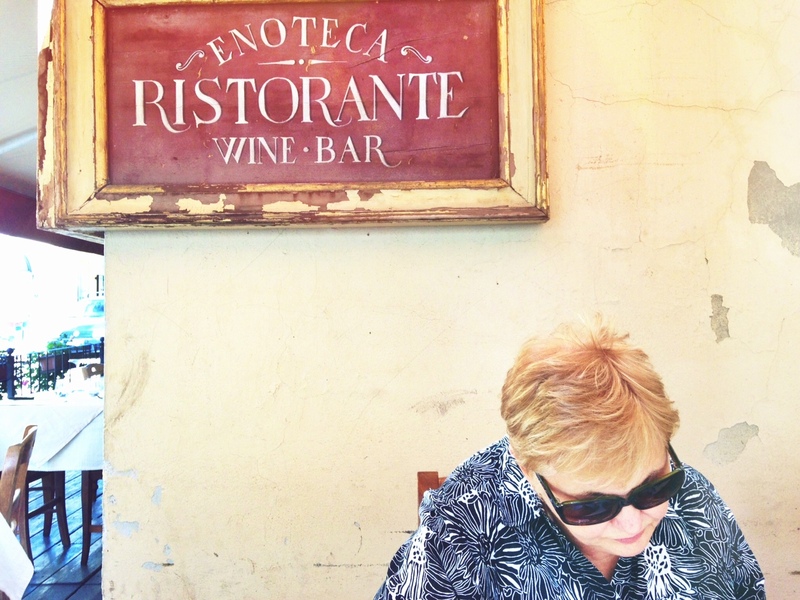 I took the two pictures below at one of the many outdoor food festivals in the main square of Sansepolcro, my town in Italy. Italians take their honey very seriously and, especially in Tuscany, you will find many types of honey like the organic (biologico) brands below. A closer look below. 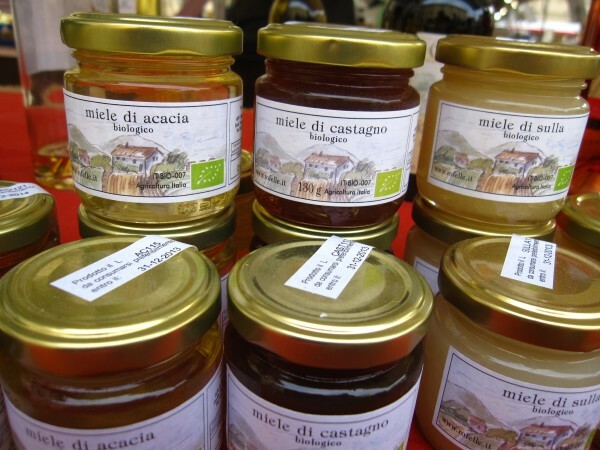 There’s acacia honey and chestnut (castagno) honey. 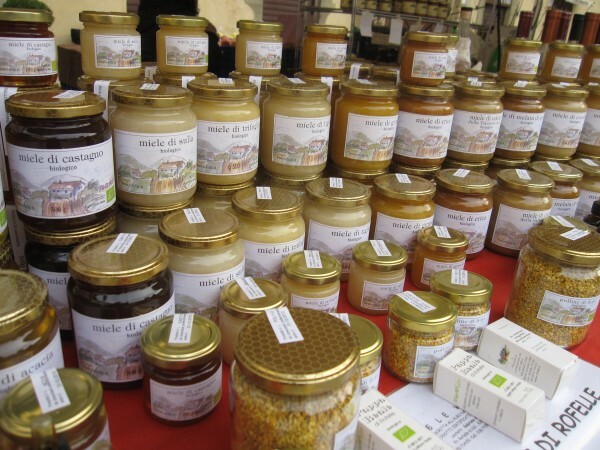 On the right you see the miele di sulla honey. It’s made from the herb hedysarum coronarium native to Italy and other Mediterranean countries in that part of the world. 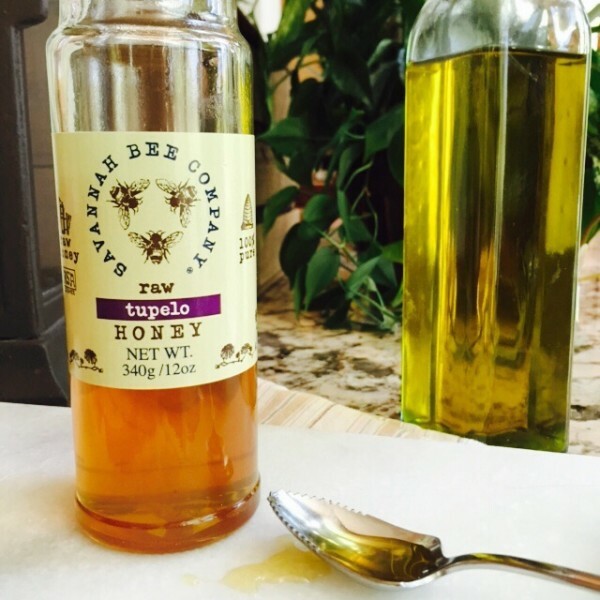 Back here in the U.S., I used a tupelo honey that my sister-in-law had given to me as a gift. It’s absolutely delicious and from the Savannah Bee Company in Georgia. You want to use a more liquidy honey rather than a solid one so you can drizzle it over the endive. You will also drizzle a bit of olive oil over the whole dish as a finishing touch. Use the best oil you have. Be sure to have lots of napkins on hand as this “finger food” can be a little sticky on the fingers. (The fork on the picture below is just for show.) Whether you use your fingers or choose the high road with a fork, keep in mind a quote from the Savannah Bee Company Web page: “Dry white wine, a blue cheese variety and honey when combined activate the entire range of the human palate.” So pour a glass of dry white, grab a napkin and dig into these tasty little babies. Cut the bottoms off Belgian endive heads, pull away the better looking leaves, rinse and gently dry them and lay them out on a cutting board. 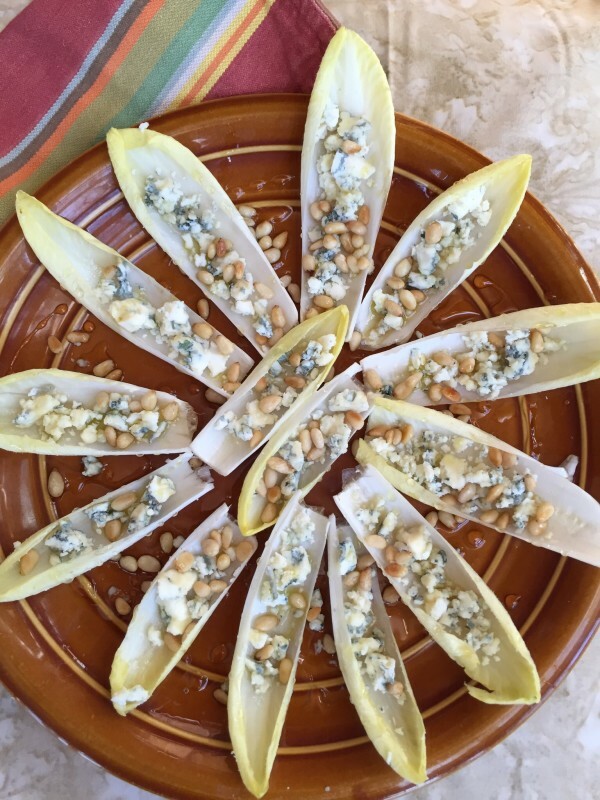 Crumble the Gorgonzola and distribute it evenly inside the endive leaves and arrange them on a serving platter. In a dry skillet over low heat, toss the pine nuts for one to two minutes. Be careful not to over-toast them or they will become bitter. Let them cool. 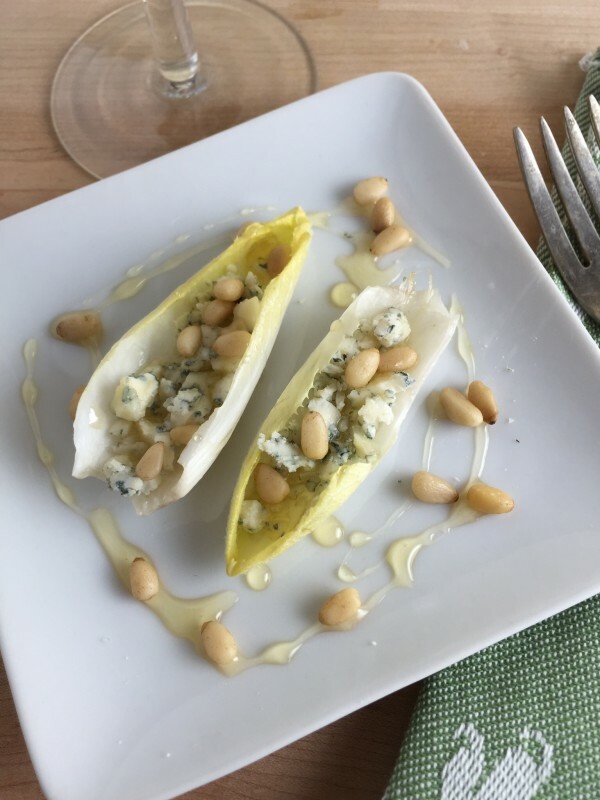 Raise the honey high over the endive and drizzle it in circles over the dish. Drizzle a scant amount of olive oil over the endive and scatter the pine nuts over the salad. Serve and watch them disappear. Have plenty of napkins on hand.